Several conference presenters have graciously made their presentations available as handouts. Watch this page as we continue to post material. 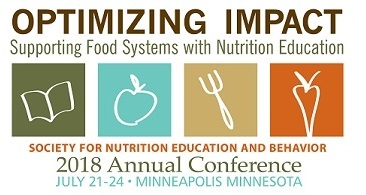 SNEB invites proposals for conference sessions and for pre- and post-meeting workshops for the 2018 Annual Conference July 21-24 in Minneapolis. Session organizers must be SNEB members or working with a SNEB Division. Proposals are due by Friday, Oct. 6 and must be submitted online. The online submission form will open on Friday, Aug. 18. SNEB mourns and remembers Dr. Samantha Ramsay, who died on July 30, 2017. Dr. Ramsay, Associate Professor of Food and Nutrition, University of Idaho, recently presented an oral abstract at the SNEB 50th Annual Conference, titled Use of the Socioecological Model to Identify Factors of an Obesogenic Environment in Families with Young Children in Mexico. Prior to speaking at conference, Dr. Ramsay traveled to Africa with SNEB Past President Mary Murimi to present at Daystar University's Inaugural Chancellor's Forum 2017 in May. Daystar published this tribute in her honor. Dr. Ramsay has been a member of SNEB since 2004 and has served in various capacities within the Society, including serving on the 2016 Conference Planning Committee, SNEB Abstract Review Co-Chair, the Journal Committee for the Journal of Nutrition Education and Behavior, and serving on the Journal Board of Editors. She is survived by two sons, Ryan, 12, and Reidar, 9. Read the full obituary here. This webinar for new SNEB members will show you how to connect and utilize the great resources available to you as a member of SNEB. Not a new member? Join us for a refresh on how to get the most out of your membership. After registering, you will receive a confirmation email containing information about joining the webinar. There is no cost to participate. Interview: Maryam Kebbe and Geoff D. C. Ball discuss a new study from the University of Alberta that investigated the way families use Conversation Cards© as a tool to promote pediatric weight loss and how their card selections aligned with family characteristics. The National CACFP Sponsors Association has put together a fun activity flyer for childcare providers and centers, and a coloring page for children in anticipation of the eclipse next week. Download here.